Voters in the south of Brazil have been asked in an informal vote whether they want to be part of a new country. The referendum was organised a week after a similar vote in Catalonia by a secessionist movement called "The South Is My Country". The group's leader, Celso Deucher, says he hopes to gather three million votes. At polling stations in the Paraná state city, Londrina, voters told local media they were disillusioned with the federal government and a giant corruption scandal that has seen dozens of politicians and members of the business elite jailed or indicted. Acacio Fernandes Tozzini told online newspaper, Redacaõ Bonde: "Our nation has reached a dramatic level of political disorder that is impossible to mend. We want to get rid of Brasilia, Brazil has reached the apex of corruption." Others complained that the south of Brazil saw little return from taxation which mostly benefitted the poorer northern regions of the country who have bigger voting rights than the south. Paulo Mauricio Acquarole said: "If you look at the six or seven states above us (in the northeast), altogether they don't give what the three states of the south give in taxation. Proportionally they have the same number of votes as Rio Grande do Sul, Santa Catarina and Paraná. The south of Brazil has expressed secessionist tendencies before, ever since Italy's Giuseppe Garibaldi helped it achieve a short-lived semi-independence in 1836. Last year a similar vote in October 2016 organised by "The South Is My Country" gathered 617,500 votes. Over 95% of the voters in the three states said they were in favour of separation. Few Brazilians believe the separatist movement will succeed, not least because it is forbidden by the constitution which proclaims that the country is "formed by the indissoluble union of states". 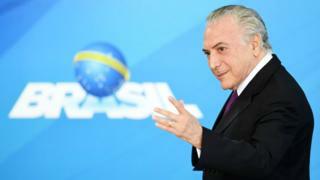 But the poll is another indicator among Brazilian voters of anger towards the federal government which they say has failed to tackle a spike in violence across the country and has been unable to overturn the worse recession in more than a century. Analysts say the corruption scandal has also destroyed support for the political ruling class leaving next year's elections wide open.